SERVPRO of Roanoke Rapids recently held a Continuing Education Class for Realtors on Mold. SERVPRO offers these Continuing Ed classes to both Insurance and Realtor Professionals Free of Charge. Realtors from Roanoke Rapids, Lake Gaston, Virginia and surrounding areas gained knowledge on the contributing factors, dangers and remedies for mold and fungus. SERVPRO Franchise owner and class instructor, Cindy Baldwin emphasized that first it is important to remove the moisture source, make sure the area is completely dry and afterwards a thorough cleaning is in order. She also warned of the importance of wearing a mask that can filter both fine particles and gas as well as other proper protective equipment. She explained the biggest indicator of mold is your nose since mold can grow anywhere there is moisture and leaves a musty, bad smell. Cindy explained there are thousands of kinds of molds and those molds are a part of every environment. Cindy, along with her husband John Baldwin, also part owner of the Franchise, gave suggestions homeowners can do to prevent mold from getting out of hand included keeping crawlspace vents open year-round and making sure attics have proper ventilation. Since airflow is extremely important, Cindy also said to make sure dryer vents are properly attached and that the air flows to the outside of the house, not under it. As the class concluded, John and Cindy both demonstrated and discussed the process, equipment and treatments SERVPRO uses for mold remediation. Feedback from class participants was very positive and indicating they look forward to future classes. Weather forecast for Eastern North Carolina predicts freezing temperatures in January-February 2019! Water is one of life's necessities, but frozen water can cause major damage. Water's unique property to expand as it freezes can cause metal or plastic pipes to break. Pipes that run against exterior walls that have little or no insultation. Keep the thermostat at the same temperature day and night. Set the temperature at 55* if you are going to be away during cold weather. Hopefully all your efforts to avoid frozen pipes will be successful. BUT is not, you will know it when the pipes begin to thaw! 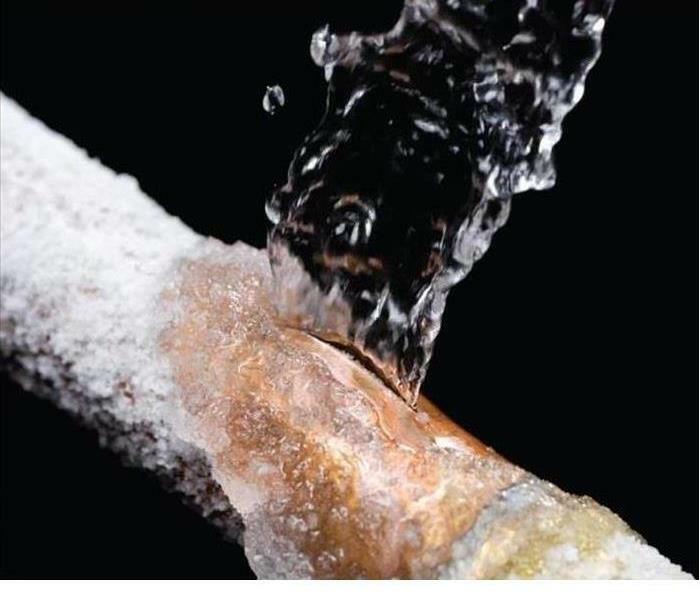 Frozen pipes can quickly cause a lot of damage to your property. When and if this happens, call SERVPRO of Roanoke Rapids 24/7. We can make it, "Like it never even happened®." SERVPRO of Roanoke Rapids specializes in storm and flood damage restoration. Our crews are highly trained and we use specialized equipment to restore your property to its pre-storm condition. SERVPRO of Roanoke Rapids specializes in the cleanup and restoration of commercial and residential property after a water damage event. Our staff is highly trained in property damage restoration. From initial and ongoing training at SERVPRO’s corporate training facility to regular IICRC-industry certification, rest assured our staff is equipped with the knowledge to restore your property. When your business is in danger from a storm you can’t afford to risk your investment to water damage and a flooded building. There are many ways you can prepare your commercial property for an oncoming storm and minimize the damage as much as possible. Your first priority should be to have a plan set for when a disaster hit. This plan needs to have clear steps to outline what to do in an emergency. It will also need to allow you to respond as quickly as possible as soon as you learn what threats the disaster will cause. The plan should include how to protect your building’s structure, how to safeguard your equipment, and the first steps of how to recover. Be ready to minimize damage with weatherproofing. This can include sandbagging the exterior of your building, installing weather stripping, moving your equipment and inventory to higher ground, and sealing any leaks. Minimize as much damage as possible by preventing storm water from intruding on the building. One of the most important things you can do is back up your business data. You always want to have a few different ways to back up your office information. When the storm comes, your first instinct may be to stay as long as possible to ensure your building is appropriately protected. Instead, you should be focusing on safety. Lost inventory, equipment, and data can be recovered. Restoration professionals can repair your building. Your safety should be the greatest priority. Does your Ronaoke Rapids Home Have A Mold Problem? After a water disaster has struck your home, it can be hard to imagine your home is even worth the hassle of saving. Here at SERVPRO of Roanoke Rapids we want to let you know that there is hope! We understand that water damage can wreak havoc on a home or business. Whether the damage is due to flooding, a pipe bursting or an appliance running incorrectly, the result is the same. There will always be a mess to clean up in a hurry before the water causes damage and mold begins to form. Once the damage has occurred, the fastest way to remove excess water is to rely upon the services of a local restoration company like SERVPRO that can get to the site quickly and begin a fast water extraction plan. We have industrial grade pumps, wet-vacs, and even mops and buckets to remove the bulk of the standing water. The faster you call to have your emergency handled, the better the outcome will be. Every minute/hour that goes by is more time in which your home is potentially “out of commission”. When SERVPRO is there is quickly we can help mitigate the loses and get you back into a safe home environment. Once you contact us, we can begin a full program of restoration. First, an immediate inspection and assessment of the damage and adjacent areas and then an estimate of the costs involved recovery are given to you. If you agree to the service, the professionals will then extract all of the remaining water in the building, checking especially for voids where water can go without being detected in most cleanup efforts. Our trained staff can make sure the building is completely dry. The use of moisture meters, infrared cameras and hygrometers enhance our ability to guarantee dryness. When all of the excess water and any mold growth has been taken care of our professionals will clean and restore any furniture or other implements that water has damaged. A full check will be performed to make sure your building has not sustained any structural damage. When you need prompt and efficient service for water damage, SERVPRO of Roanoke Rapids is here for you. 1. Turn off the source of heat, meaning turn off the burner as soon as possible. 2. Cover the fire with another pot, metal lid, or cookie sheet. If you do not have another pot or lid, try putting baking soda or salt on top. Doing this will suffocate the fire because it will not have as much oxygen reaching it. 4. If you feel unsafe, go outside to a safe location and call 911 or help. 1. Use water or any fabrics to put out a grease fire. 2. Use baking powder. Might look the same as baking soda but the chemical make up is very different. 3. Moving the pot that’s on fire. Devastated over your water damaged Family Bible or important papers? SERVPRO of Roanoke Rapids can help! We can vacuum freeze-dry your special documents. You may want your damaged documents restored for sentimental or legal reasons. Often these documents are one-of-a-kind or are irreplaceable. These important papers include family bibles, personal/medical documents, government/business records, personnel files and blue prints. SERVPRO Document Restoration Service uses the process of sublimation. This process takes frozen documents through temperatures and pressures that turn moisture into vapor. The result is a dry document that can be restored or reused. Water damage may occur when a basement floods, water damage from about or water from extinguishing a fire. SERVPRO will help you decide which documents to save and which ones to discard. We will box up, freeze and ship your damages papers with the care and security they deserve. 2/5/2019 - MOLD – Just follow your Nose! 7/16/2018 - When Storms or Floods hit, SERVPRO is ready! 7/13/2018 - Does your Ronaoke Rapids Home Have A Mold Problem?